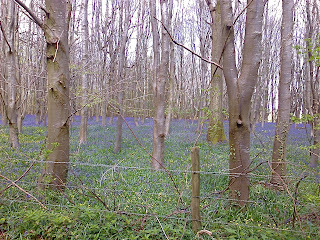 Last Sunday we went to our bluebell woods to see what was going on. They weren't fully out so we are going to have another go today. A few hundred yards past them, the road is blocked off to traffic. It is collapsing because some badgers have made a set right underneath it, literally undermining it. If you want to get to the village now, there is a four mile detour. We will want to get to the village as of July because it is the venue for H.I. 's Painting Summer School. I am not sure if the road will be fixed by then, because even though they have been killing hundreds of badgers in this area in a vain attempt to eradicate bovine tuberculosis, it is - quite rightly - illegal to mess about with their sets. I think the badgers may bring it all upon themselves eventually. I had thought about taking my newly created business cards to a large garden centre near there. This may sound as though I am panicking, but it isn't as desperate as it seems. When I was in town I made quite a lot of stuff for people's large gardens - fountains and sundials etc - and these were the days when I had a shop window with passing trade. One day, a tiny, very well-to-do, elderly lady appeared at my workshop door and asked if I could make a stone sundial as a birthday present for her neighbour in Marlborough. I gave her some suggestions and showed her some pictures, then she settled on one elegant design which was just about small enough to put in the back of my car and deliver. When I asked for her contact details she introduced herself as Lady Darwin. She was the last of a dying breed of solitary ladies who spent Summers in England and Winters in the South of France. You knew that she always dressed as immaculately as she did when visiting my workshop, and she spoke with a quiet but confident upper class accent. After we settled on the design and price, she thanked me, turned to go back to Marlborough, then hesitated to to leave a parting message with a charming smile on her lips. "Mr Stephenson. If you let me down in any way, I will kill you. Goodbye". I wonder what method Lady Darwin would use to carry out her threat? I imagine a large revolver in a small handbag. I didn't let her down. 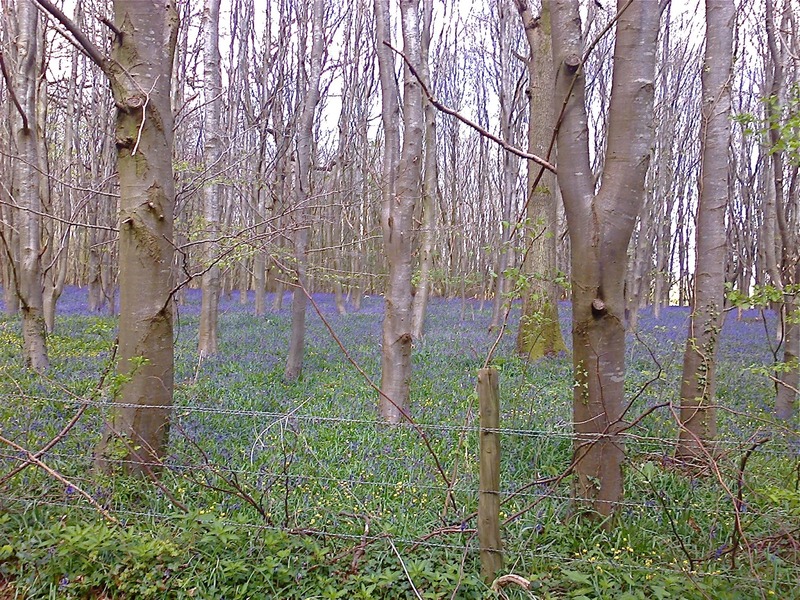 Always glad to see your annual bluebell post. That was last year's photo, but they look very similar right now. A four mile business card detour! All will be well. I have been inveigled from retirement to participate in a porcelain studio show. I had to work up my own cards on my not so trusty HP. And though I did not know of her, then, I wouldn't let Lady D down, either. Are you a potter too? Don't eat that Cream Bun that smells of Almonds. What about the Bakewell Tart? There would just be a bit of text in the middle without the personal bits. It's all down to balance. A lady who speaks her mind. Definitely the best plan. No, a lady who threatens. Pesumably you didn't let her down then. It was just a flesh wound.